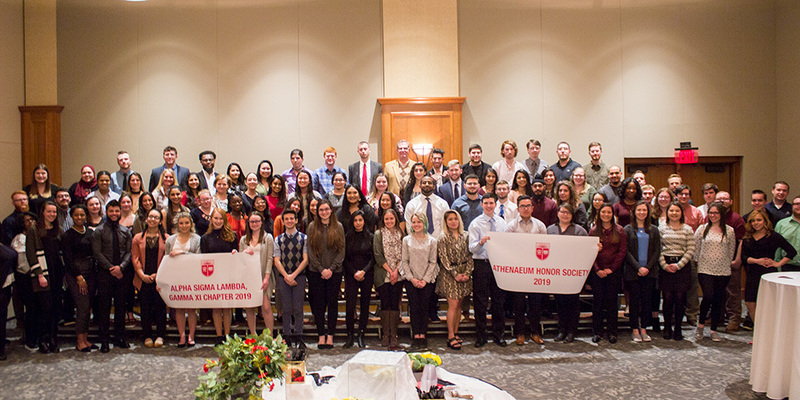 On Thursday, March 28, the Faculty of Arts and Sciences–Camden inducted five University College students into Alpha Sigma Lambda, Gamma Xi chapter, and 111 College of Arts and Sciences students into Athenaeum. Alpha Sigma Lambda has been part of Rutgers–Camden since the early 1980s. University College students with a cumulative grade point average of 3.5 or higher and at least 45 credits earned at Rutgers University are eligible. College of Arts and Sciences students have been inducted into Athenaeum since 1952; seniors with a cumulative grade point average of 3.5 or higher and 60 credits earned at Rutgers University, and juniors with a cumulative GPA of 3.7 or higher and 80 credits earned at Rutgers University are eligible. Page last updated by Faculty of Arts and Sciences at 9:17 am March 29, 2019 . This page was printed from http://fas.camden.rutgers.edu/2019/03/29/congratulations-to-athenaeum-and-alpha-sigma-lambda-inductees-3/ at 1:08 AM Wednesday, April 24, 2019.